I’m really rather delighted to say that the Tor trade paperback version of Your Hate Mail Will Be Graded: A Decade of Whatever 1998 – 2008 is now officially out and about at bookstores everywhere, making it the perfect gift for the Feast of the Epiphany — and I know you were worried about what to get people for that. It’s also the perfect gift for people who have always wanted to read my commentary on the world but have phobias regarding the Internet and/or glowy screens. On the other hand, if people want to know when the eBook version of this title will be available, well, uh. Hello. Look where you’re reading this. Although of course the book offers the best of Whatever in handy concentrated form. Distilled Whatever, as it were. 180 proof. The Everclear of Whatever. One reason I’m delighted about this particular release of Hate Mail is that it was unexpected. As you almost certainly know, the original — and fabulous — Subterranean Press release (seen up there on the computer screen) was a limited edition hardcover, limited to 1,000, on the thinking that the audience for the book would small and select; i.e., the people who already read Whatever. But as it turns out the book sold quickly and the folks at Tor strongly believed there was a larger audience for the work — and it winning a Hugo certainly didn’t hurt, either. I’m very pleased Tor is making the effort to bring the book to a wider audience. Hopefully their faith will be justified. And for me having that wider release is also meaningful. It’s no secret that one of the early motivations for writing on Whatever for me was to keep sharp in the “column” format, having written a newspaper column in the early 90s. One of my dreams when I was writing the newspaper column was that one day I could have a collection of my columns out in book form, following in the path of columnists I admired, from H.L. Mencken and Mike Royko, Molly Ivins and Roger Ebert, Dave Barry and James Lileks. Well, I didn’t get on that path from newspapers, but I did get on it, and I’m pretty happy about that. And while Hate Mail is definitely not the first book based on content from a blog (or indeed, even my first book based on content from a blog), if it’s not in fact the first collection of general interest — that is, newspaper column-like — blog posts offered up by a major book publisher, it’s pretty damn near the top of that list. 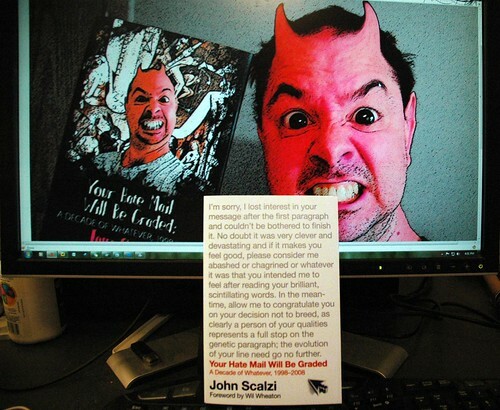 In its own small way Hate Mail is a historic book, and I’m proud of that fact. Neat (the Wil Wheaton quote is nice too). In any event: Book! Out! Now! If wanted a copy for yourself or someone else, and couldn’t get one, now you can. Enjoy. And thanks. …I was going to say it’s available from Webscriptions in ebook format, but apparently it’s not for sale anymore. Aww. Glad I bought it when I did. It’s still available for webscriptions download if you purchased it before the removal. Since Subterranean Press is doing “God Engines” and “Judge Sn” I’m hoping they’ll show up at webscriptions. Whoa. A feast, *and* an epiphany? That’s a lot of dumplings for one book. Man I really miss Molly Ivins and Mike Royko. Also, I follow five blogs on a daily basis. You, Wil and Roger Ebert are three of them. Thanks, and I’ll be looking for your book this weekend! 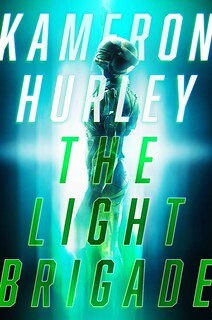 I have not actually ever said this, but it would bear repeating if I ever had: that cover is *fantastic*. Putting a top-quality putdown on the cover as the majority of the art is a brave choice, but it really works for me. Wil Wheaton? Who’s that? Also, the horns need some highlights, a little white to reflect that light (inner light, of course). So why isn’t my Amazon pre-order here right this second? Hmmm? Hey… Just realized, there’s a new type treatment for the “Whatever.” Did you point this out earlier, or am I just dumb? The new one’s okay, but I think I prefer the earlier version. Just sayin’. My original exposure to James Lilek’s was his Gallery of Regrettable Food. Got mine last week at the local B&N. Maybe I should get another as a gift. As I take down the Christmas tree today its time to think of the Feast of the Epiphany which is on Jan. 6th. That day is also important to me me because it is the start of the Carnival season here in New Orleans! We replace the red and green of Christmas for the purple, green, and gold of Carnival!!! My family will get the king cake for our “Kings Party”. Whoever gets the baby in their piece of cake has to buy the next cake. I’ve had that honor for three years running! Also carnival starts when the The Phunny Phorty Phellows have their streetcar ride down St. Charles Ave. It’s a very short parade!! More recently a group of women (with a few men) have had a walking parade in the french quater on Epiphany in honor of the Maid of Orleans-St. Joan of Arch. If you are in NOLA on February 12th, be sure to come to the parade that I ride in, The Krewe of Morpheus!!! Christmas is great, but Carnival is my favorite holiday!! I’m sure this is going to piss you off a bit, but last time you mentioned the trade was coming out, I got the details from the TOR website and recommended my local library buy a copy. Why would that piss me off? Eh. Libraries are great, and financially I’m doing just fine. I’m happy people are reading. Of course, you’re right. And I don’t think I’m the only person who does believe that the best way to support good writers is by buying their books and contributing to their bottom line. Still (and perhaps I’m showing my age here), the book budget doesn’t go as far as it used to, and it’s to see at least part of my taxes are going somewhere that doesn’t make me want to pull out somebody else’s hair. Libraries are the reading equivalent of a pusher’s free samples. Take it from a long-time addict, who has spent far far more on books than the worth of the books I borrowed when I was young. 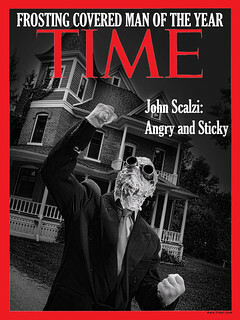 Ordered three Scalzi books on Amazon today. TGE, Hatemail, and Agent to the Stars. Bearpaw, John is the sf writer, so I bet he can see the library “issue” as one that may be in transition, at least philosophically. After all, what is a library, but a collection of books that is there for the public to use? So what is to stop each person with a server and an altruistic/charitable inclination from becoming a digital library, or mirror site of a digital library? Why shouldn’t The Gray Area Library allow the public access to his books? I’ll let you look at what I have and if you want to read some of the books in my collection you can take out a digital copy. Libraries are good! Common sense, or some materialistic variant thereof, is that we can’t let that happen because then we wouldn’t have any writers that wish to make a living from just writing. Although I’m not sure that’s a great reason to keep the rise of the digital library from forming. After all, information won’t be held in cages; once it’s digital it wants to be free. I have a source for tons of pirated digital books. I don’t bother with them, but somebody must be downloading them. If no one wanted them who would bother scanning a book and putting it out there? I’d really love to know who designed the cover! Would you mind tell me, please? The book doesn’t say, although the art director for Tor is Irene Gallo, and I suspect she had significant input on it. Excellent beat ! I would like to apprentice ecen as you amend your site, how coluld i subscribe for a weblog site?